A remote control car can be the perfect gift for toddlers of all ages. There are toys available for kids as young as 18 months, but toddlers younger than this will love to watch their parents or siblings show them how it works. There are many different styles of radio controlled vehicle, from cars to trucks to animals. You’re sure to find something from the selection below to suit your toddler’s personality. RC cars for toddlers are generally inexpensive, but they are guaranteed to provide hours of entertainment for the whole family. An RC car can be the perfect educational toy for your toddler. Not only are they super fun, but they can help your little one improve their hand-eye co-ordination. We have chosen nine of the best remote control vehicles for toddlers available right now, and outlined their features so you can make the best choice for your child. There are a few things worth thinking about before choosing a remote control car for your toddler. Think about their motor skills – will they be able to use a controller? Some are very simple with one or two buttons, so with help even a one year-old toddler can use these. Others are a bit more difficult and would be better suited to older toddlers with a bit more co-ordination. All the products here are designed to be an introduction to RC vehicles, so they are suitable for kids who have never used one before. If you are buying for a young child, consider how durable the product is. Don’t choose something with small or delicate parts which may become broken after some rough handling by your toddler. It’s not worth buying a vehicle with too many fancy features – your toddler won’t be able to appreciate them. This is a great first remote control car for a toddler – it has fun music and flashing lights. The tires on this car can rotate 360 degrees. The range is up to 100 feet which is more than enough for a toddler. Parents will be pleased to know that the car comes with a charger and the remote only requires two AA batteries. The car can run for up to 40 minutes on a full charge which should be more than enough for your toddler’s attention span. Older siblings will love playing with this car too – they will never get bored with making it do tricks and stunts. The car is very robust and can withstand being hit against walls and bumping down steps. It offers excellent value for money for years of entertainment for your toddler. This RC fire truck has a very attractive design sure to appeal to young children. It has lights and making various noises which sound just like a real fire truck. The truck is perfect to use alongside friends – the frequency means you can race up to six trucks together! The RC toy can run for about 30 minutes on a full charge, and charging can be done via USB. It is ideal for both indoor and outdoor use and can run well on different terrains. It is also available in a police car version, so why not get one of each and race along with your child! The fire truck is quite fast, so perhaps better suited to older toddlers. The high speed also makes it perfect for outdoor use – young kids may struggle to control it on hard floors indoors. This excellent value set is perfect for sharing with friends. The remote is simple and easy for little kids to hold. Each car comes with two removable figures, so you can mix and match, or play with the figures with other toys. Your child could even let his favorite toy take a ride in his new RC car. These car toys are very strong and durable so can withstand being crashed into walls by toddlers! They play siren noises and the lights flash, making them very appealing to youngsters. There are a few buttons on each car so your child can try out all the different sounds they make. Both the vehicles and the remotes require AA batteries, so it may be ideal to get some rechargeable ones as you’re sure to go through them quickly. This set is perfect for you to share with your child, or for siblings to play together as each car has a different frequency so they can be used at the same time. This fun remote controlled car is a great introduction to RC toys. It is perfect for very young children thanks to its super-simple remote design. It also features fun songs sure to delight your toddler. 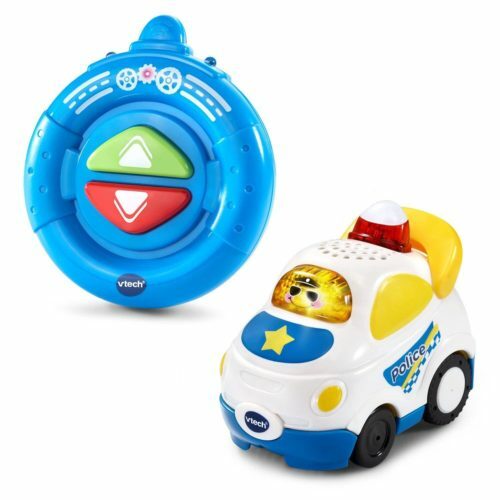 The car can be used along with other VTech Go! Go! sets, and up to three of the cars can be raced at once. This makes it the ideal gift – it can be added to as your child grows. The tracks have loads of fun features such as elevators and ramps – your toddler will love to watch the car going round the course over and over again! The police car can be used on its own and will run well on most surfaces. However, the car can only go backwards and forwards and cannot turn without being placed on the track. So, it’s definitely worthwhile buying some extras if you really want your child to enjoy this toy for many years. 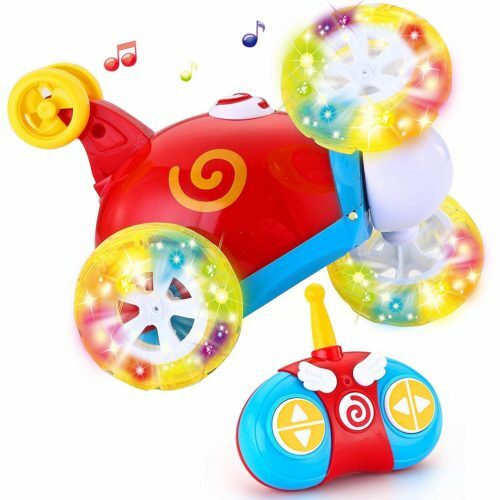 This fun remote control toddler toy overs great value – it can be used as two toys in one! Keep the car inside the tire and it will roll in different directions, forwards and backwards. Take the car out of the tire and it works like a regular radio controlled car. The control is simple in design and easy for little kids to hold. Unfortunately, only one can be used at a time as there is only one frequency. It can be a bit difficult for very young children to work out how to steer the car, but with help it’s ideal for kids aged three and over. 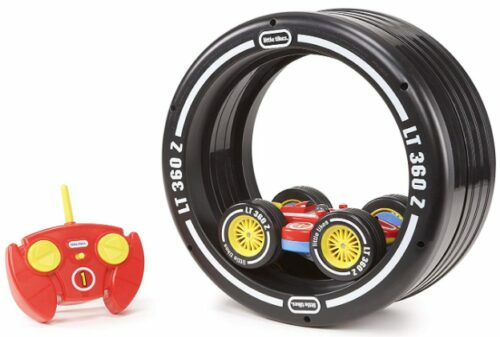 The car can flip inside the tire, causing it to change direction – toddlers will love watching this! The car has different colors on each side – your child will love to see it change as it flips around. This is a great-value toddler radio controlled car. The controller is simple to use and easy for little hands to hold on to. The car is a fun design in bright, bold colors that young kids will love. The driver can also be removed to play with separately. The car plays music and sounds and there is a button on the remote to switch the lights on or off. There are buttons on the car to make different noises – your child will love experimenting with these too! There is only one frequency available on this radio controlled car, so only one can be used at a time. It drives well on all indoor surfaces and can stand up to being crashed into walls and furniture. This is the perfect introduction to remote-controlled toys for little kids! This is a fun radio controlled toy perfect for one year olds and above. 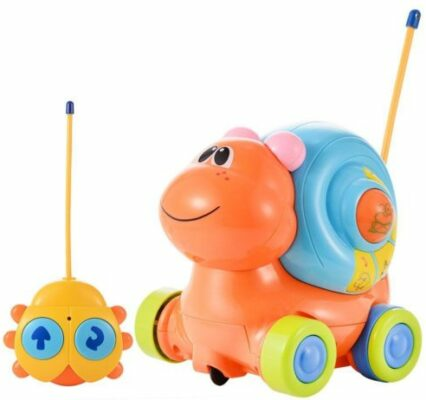 The snail design is appealing to toddlers, and it also has fun lights and music to make it even more exciting. The remote has only two buttons, one for forwards and one to turn. It’s chunky and easy to hold, making it perfect for even the youngest of toddlers. It travels quite fast, so kids will love chasing it around too! Even babies who are too young to drive it will love to follow it around. It is made of strong plastic and has no fragile parts, making it excellent for young children who aren’t always careful with their toys. This RC toy is great value for money – it will give your kids a few years’ of entertainment at a great price. The TOMY RC vehicle is sure to delight kids who love all things tractor! It has a fun, friendly design sure to appeal to kids as young as 18 months. It has a simple, two-button controller which can make the tractor drive forwards and turn. Parents will love the auto shut-off feature which will save battery life. The tractor toy is also strong enough to be able to crash into walls and furniture without scratching or damaging anything. The range on the RC tractor isn’t very long, but for young kids it should be more than enough. It runs well on indoor surfaces, and goes quickly on harder floors. The toy is the perfect size and weight for little kids to play with, and it gives great value for money. 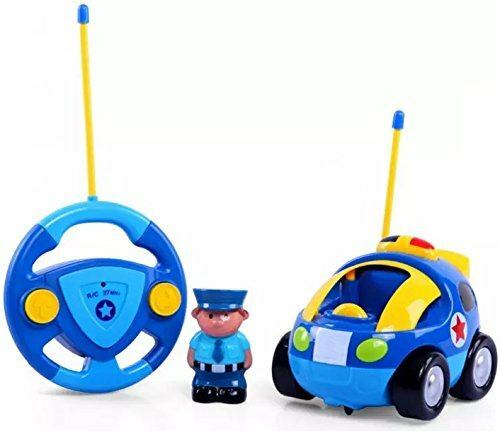 This fun police car is a great introduction to remote-controlled toys for toddlers. The fun design is sure to appeal to little kids and they will love playing with the removable driver. It’s also available in other designs with different frequencies meaning you can race more than one car together. It features fun sound and light effects which toddlers of all ages will love. The controller is easy to use, with one button for forwards and one for reversing to the left. The antennae are strong and safe, so you can be sure your child won’t break them or get hurt. The car and remote are also made of durable plastic guaranteeing your toddler years of fun! The Prextex Set of 2 RC cars is the ideal choice for young toddlers’ first radio controlled toy. They are easy to use and great for sharing with friends or siblings. Parents will also love playing along with these fun race cars! The fun lights and sounds make them perfect for toddlers. The removable figures is a nice extra feature, give your child more ways to use this great product. If you are on a budget or don’t want to spend a lot of money on a first RC toy for your toddler, the this rc toy car is a perfect choice. It offers excellent value for money, and toddlers of all ages are sure to love it! The fun, attractive design is perfect for even the youngest toddlers, and the remote is so easy to use. It also has fun sound effects sure to delight your toddler, making it an excellent budget pick.